Have you ever looked at your calendar and wondered: “How will there ever be time to exercise?” Between work, family life, friends, and other social commitments, many people struggle to find time to fit fitness in. But, what if there was a way to take the guesswork and rigidity out of your exercise routine and instead, give you the tools you need to make it a part of your day—and all at your fingertips? Freeletics, “The intelligent fitness coach in your pocket,” is doing just that. With three apps aimed at all fitness levels and a nutrition app that has the ability to customize your daily eating plan, this on-the-go approach to diet and exercise is helping millions of people improve their health and wellbeing. And how could it not? The concept is actually quite simple: freedom to workout anywhere, anytime. Paste talked with Daniel Sobhani, CEO at Freeletics, to get a better idea of how this app is changing the face of exercise and making it easier for millions of people to get fit. Paste Health: What is the appeal of “on-the-go” workouts? Daniel Sobhani: In many areas, we’ve seen consumer habits change over the last few years. We are always online, always connected and always on the go. We want things to be delivered straight away, services to be available 24/7 and hobbies to fit around our busy schedules. And fitness is no different. If it’s difficult to get to the nearest gym, your personal trainer has a full schedule, or you travel a lot, these hurdles will eventually prevent you from sticking to your fitness routine. An on-the-go workout removes these problems and leaves you with no excuses not to train, because it can be done anytime and anywhere. PH: Why are more people turning to this type of workout? DS: This type of workout fits everyone’s needs. With over 17 million users worldwide in just a few years, we have found people like that it’s easily adjustable to adapt to different fitness levels and it will fit into literally every schedule. Our workouts usually take an average of 15-30 minutes, which is time that everyone has in their day. It also offers people the freedom they want. If you don’t want to train in a full gym, then you can train at home. If you travel a lot, you can train in any hotel gym or even in your room. If you prefer to be outside, you can do these workouts in the local park and you can even join other users in a group. PH: What are some of the more popular modes of exercise when people choose this style of working out? DS: We have found the Freeletics approach to training has been incredibly popular amongst people looking for flexibility and personalization in their fitness. 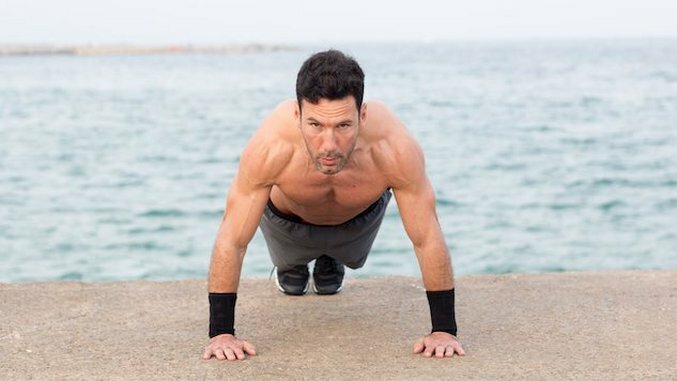 The training itself is a mixture of HIIT and HIT based bodyweight-only exercises. So, no weights required. Just short, intensive bodyweight workouts and focused technique sessions to help users learn the correct movements and form. All you need is yourself and your smartphone or tablet to get an incredibly effective workout in—it couldn’t be easier. And the workouts are flexible enough that they can literally be done anywhere on just 2×2 meters of space. PH: Why should someone try the Freeletics apps? DS: Freeletics offers a high success probability for you reaching your physical goals and feeling good about yourself through anywhere and anytime access, a very high level of individualization, and a supportive, motivational community of over 17 million people. We have four different apps at the moment: Freeletics Bodyweight, Freeletics Running, Freeletics Gym and Freeletics Nutrition. Our training apps are based on HIT training, with Freeletics Running focusing on interval sprints and Freeletics Gym on barbell and rowing workouts. Freeletics Nutrition completes the package by acting like a nutritionist in your pocket, helping you to eat clean and keeping track of your macros so you don’t have to. The free version of Freeletics Bodyweight, Running and Gym, contain a selection of workouts accessible to everyone. In addition to the free versions, users can buy the “Coach,” which is a state-of-the-art digital personal trainer that builds tailored week-by-week training plans, completely customized to the users fitness level and goals. The Coach also analyzes performance by tracking progress and adapting training plans accordingly every week. One Training Coach subscription gives users access to all three Coaches in the training apps, leaving them free to choose their preferred training and try different combinations. In the Nutrition app, the Coach algorithm takes important parameters such as food preferences, daily activity levels, physical characteristics and eating habits into account in order to create individualized weekly meal plans. Caloric intake, meal numbers and macronutrients are all tailored to the users needs and goals. PH: Will you share a few sample workouts with readers they can try at home? DS: Yes. At Freeletics, we name our workouts after gods to give a stronger sense of achievement—because who doesn’t feel great when they say “I just crushed Zeus?” These workouts are to be done as fast as possible, using breaks to recover in order to go full speed in the next round again.